Car disposal is a good option for those who have old and beat up vehicles that are nothing more than a huge piece of junk. Although this junk car may seem completely worthless to you but you can turn this beat up car to your profit and you can even earn cash for junk cars by various ways. In this article we will discuss about vari-ous ways in which you can dispose your vehicle and make some profit on the side. There are various method in which you can dis-pose your vehicle that is no longer roadworthy. 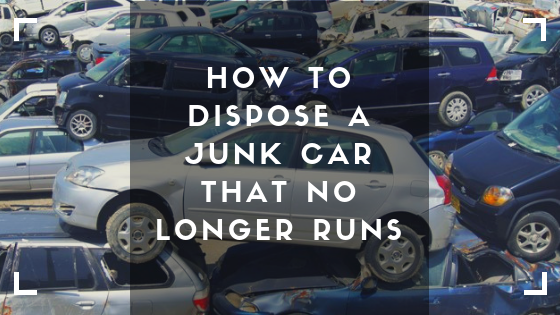 Let us take a look at the junk car disposal methods. There are many charity associations out there that runs programs where you can donate your junk vehicle. These vehicles are used for providing employment opportunities to underprivileged people who can fix these vehicles and make them roadworthy again. Some charities scrape your car for parts or send to recycle centers for cash. In return for donating your car you will receive a tax re-ceipt that you can use on your tax preparation. Also whatever a charity benefits from your donation, you receive a small part of it. There is a huge market for used car parts. There is always high demand for parts of popular car models. Even if a car does not run anymore, there are many parts that are still valuable and are worth some money especially the electronic components, metal body parts and powertrain components. If you can use your hand with a mechanical tool or two, you can dismantle your car and sort out the parts that you may deem usable and then you can sell off these useful parts. You can advertise your car parts for sell on Craigslist or eBay for quick response from sellers. If you need your junk car gone right away you can sell it to any car junk removal company and earn some quick cash in return. You can look up for junk removal companies from online listings and you can call them to know the best rates for your vehicles. Select the service that best suits your needs and the junk removal service will tow away your car and you’ll be payed in cash instantly. Alt-hough the amount of cash you receive will be a very small amount but you get the cash right in hand and you don’t have to go through the hassle of dismantling your car. If your car is in a bad shape or doesn’t run at all you can sell them to a salvage yard. The salvage yards recycles your car in the best possible way. Most of the parts like car engines, steel parts and windows etc can be reused on another vehicle. Recycling the cars also saves thousands of barrels of oils on recycling. But before you sell your car do your research and find a good yard that is envi-ronment friendly as many yards out there don’t remove items properly which are toxic and might harm the environment. Having a junk car in your garage that doesn’t run can turn out to be a big pain. But luckily there are a few options through which you can get rid of your junk vehicle. Consider looking into the options mentioned in this article to get a helpful insight in disposing your junk car. The methods mentioned above might just help disposing your run down vehicle much easier.